MIT Press (MA), 9780262012799, 309pp. A person with synesthesia might feel the flavor of food on herfingertips, sense the letter "J" as shimmering magenta or the number"5" as emerald green, hear and taste her husband's voice as buttery goldenbrown. Synesthetes rarely talk about their peculiar sensory gift--believing eitherthat everyone else senses the world exactly as they do, or that no one else does.Yet synesthesia occurs in one in twenty people, and is even more common amongartists. One famous synesthete was novelist Vladimir Nabokov, who insisted as atoddler that the colors on his wooden alphabet blocks were "all wrong. "His mother understood exactly what he meant because she, too, had synesthesia.Nabokov's son Dmitri, who recounts this tale in the afterword to this book, is alsoa synesthete--further illustrating how synesthesia runs in families. 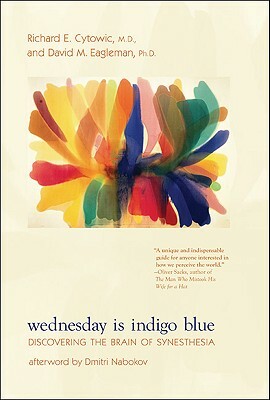 In Wednesday IsIndigo Blue, pioneering researcher Richard Cytowic and distinguished neuroscientistDavid Eagleman explain the neuroscience and genetics behind synesthesia'smultisensory experiences. Because synesthesia contradicted existing theory, Cytowicspent twenty years persuading colleagues that it was a real--and important--brainphenomenon rather than a mere curiosity. Today scientists in fifteen countries areexploring synesthesia and how it is changing the traditional view of how the brainworks. Cytowic and Eagleman argue that perception is already multisensory, thoughfor most of us its multiple dimensions exist beyond the reach of consciousness.Reality, they point out, is more subjective than most people realize. No merecuriosity, synesthesia is a window on the mind and brain, highlighting the amazingdifferences in the way people see the world.